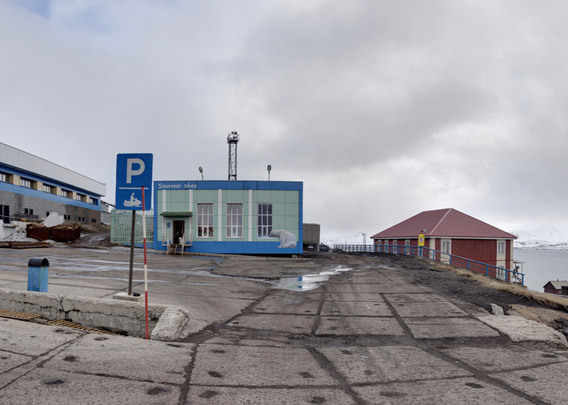 After the tough ascent of the long staircase from the harbour up to central Barentsburg, you reach this place which neighbours the large Culture House, a souvenir shop and the old canteen (“Ctolovaya”). The latter one is currently empty and a bit of a ruin, but it is protected by law as it is one of very few structural remains in Barentsburg pre-dating the Second World War. Most of Barentsburg was destroyed during a German attack in 1943. There is a large picture on the wall of the old canteen showing a typical early 20th century polar explorer. Some say that it is an idealised portrait of Wladimir Alexandrowitsch Rusanov (more about him in the section about the old museum/Culture House), while others point out that there is little similarity between the person in the picture and Rusanov. Anyway, the poem in the picture is supposed to tell people that the future of mankind is somewhere far north, trying to convince earlier inhabitants of Barentsburg of the importance of their isolated presence in the Arctic and their work. If it worked ..? Actually, Rusanov may not have been the right person to deliver such encouraging words to his later polar fellows: he disappeared in the Russian Arctic during his last (well, obviously his last) expedition.